We want to make our kitchen the heart of the neighbourhood, a place where people cook together, eat in company, share good times and enjoy the comfort of food and community. Welcome to Connect Community Kitchen! In 2018, Connect Victoria Park decided to go back to the kitchen. Built in 1960, our kitchen facilities at The Homestead were one of the first in WA to prepare and serve Meals on Wheels and, for the past six years, have been used by Manna Inc. to cook and offer meals to the homeless. Manna continues to provide this valuable service out of our kitchen, but now we share the space to build community around food. 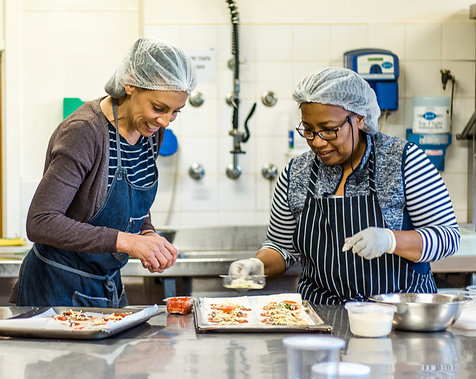 Every Tuesday, our kitchen coordinator Susan Saxby is in the kitchen with a team of volunteers to prepare and deliver a delicious lunch to Village Hub members – anyone from the community is also more than welcome to join! Fortnightly on Saturday mornings, we offer Learn, Cook, Share, with unique cooking demonstrations by local residents. Open to the whole community, the sessions are about sharing a skill, cooking ad enjoying something yummy together. Our inaugural session took place on September 22, 2018, with Amanda sharing her Victoria Sponge Cake skills. Next scheduled sessions are Sourdough on October 6 with Lindi, Marmalade on October 20 with Hilary, and Pasta on November 3 with Kate. You can find and register for all of them at our Calendar. If you live in the Vic Park area and would like to share a cooking skill with others, get in touch! Finally, we intend to always cook a bit in excess to start a Community Chest, from which local people needing a neighbourly hand can draw a hamper of meals and treats if they are experiencing health issues or other hardship. Stay tuned! Connect Community Kitchen is driven by volunteer power, and we are hungry for your help. Want to get busy, cook together and help connect community? Give us a call at 08 9361 2904 or email admin@connectvictoriapark.org.